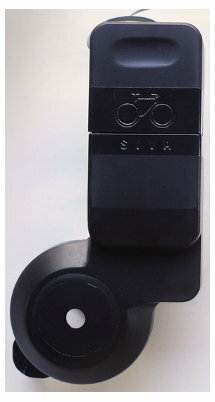 David Delcourt, one of the co-founders of Siva Cycle came up with the idea for the bicycle charger a couple of years ago. As a bicycle commuter, he often found himself low on battery power and struggled to find a charging outlet in coffee shops. With a career in energy and sustainability, it occurred to him that his bicycle was a natural solution to generating power. After teaming up with Aaron Latzke, an engineer, the two set out to redesign the bicycle generator for the 21st century. Bicycle generators are nothing new. Many of us probably remember the old-style dynamo generators that rubbed on the bicycle wheel as the bike was pedaled. While these generators work (usually to power a headlight), they do not provide steady current and not at the correct voltage for USB devices. The Atom was designed specifically for USB devices (phones, iPods, GPS units, etc...). The generator outputs a clean 5V at up to 500mA. 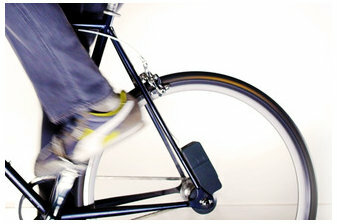 Integrated into the generator is a 1650mAh removable battery pack that charges while you pedal. You can either charge your device (by plugging it into the included USB port) and the integrated battery as you pedal or instead charge just the battery. When you stop, you can take the battery pack with you and plug your device into it for mobile power. The Atom is installed on the rear wheel of the bike in a few minutes. The rear quick release axle is removed and the wheel is pulled slightly out of the frame. The Atom is them set in place on the rear hub and the wheel assembly is put back in the frame and the quick release axle is put in place. The Atom comes with a 3 foot ribbon cable that has a USB port on the end of it. This port can be positioned under the bike seat or on the seat post where it's convenient to plug devices into it. The project started out on Kickstarter and after successful funding has been in final developement. The Atom should start shipping Fall 2014 for $99.